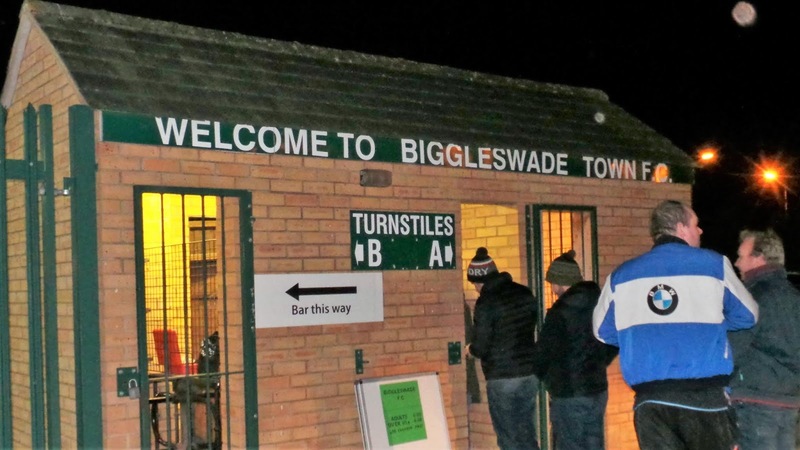 BIGGLESWADE TOWN FC was established in 1974 though they only switched to their current name at the end of World War 1 having previously been known as Biggleswade and then Biggleswade & District. They played only friendlies until the late 1890s when they joined the Biggleswade & District, Bedford and District and Northamptonshire League. The latter would go on to be the United Counties League, where the club would remain until 1955 when they joined the Eastern Counties League. Biggleswade generally struggled here, the highlight being a 9th place finish in 1962. A year later, they would rejoin the United Counties League and despite having two 3rd place finishes, they'd be relegated to its second tier in 1976. 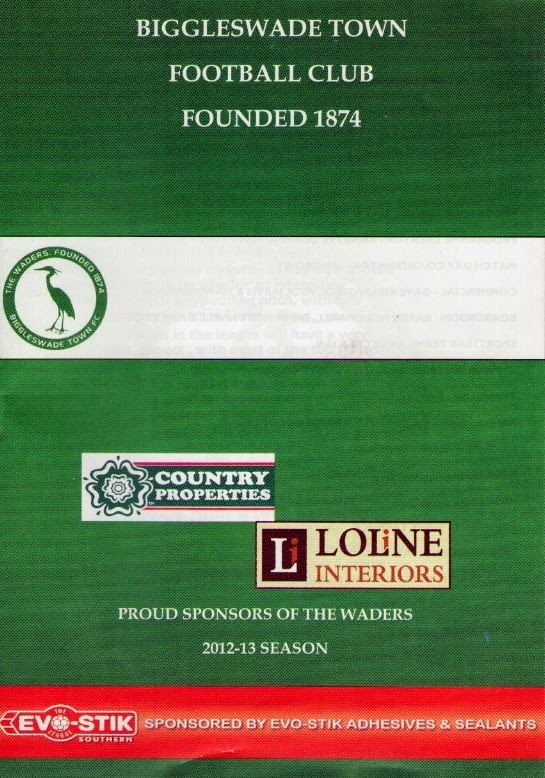 Another change of league came in 1980 as Biggleswade Town joined the South Midlands League. 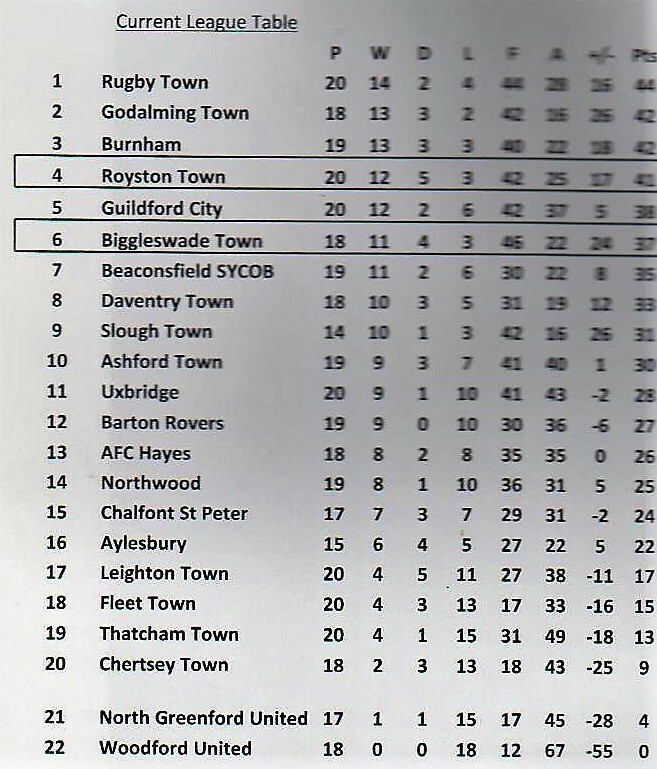 Finishes ranged from 13th in the second tier in 1984 to Premier Division champions in 2009 by which time the league had merged with the Spartan League. This league win allowed them to make the step up to the Southern League for the first time in their history. 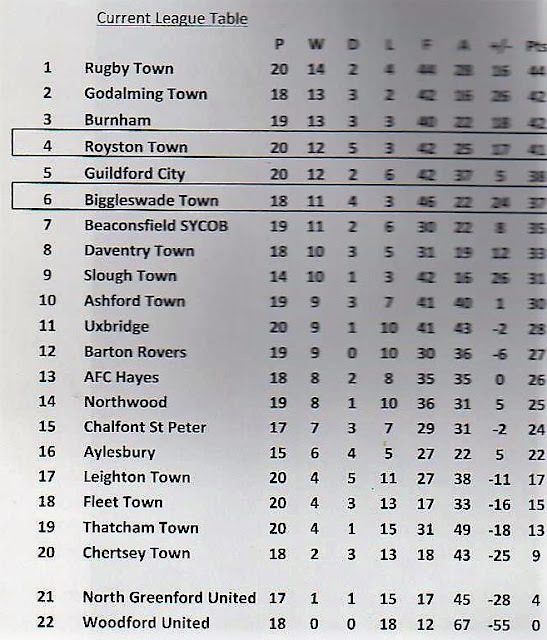 They'd remain in Division 1 Central until 2013 when after a 4th place finish and playoff wins over Godalming Town and Rugby Town, they were promoted to the Premier Division. They've survived at the higher level ever since, a best ever finish of 7th coming in 2017. Before my latest visit, Biggleswade Town sat in 6th place with a good chance of making the playoffs in the Southern Premier Central. 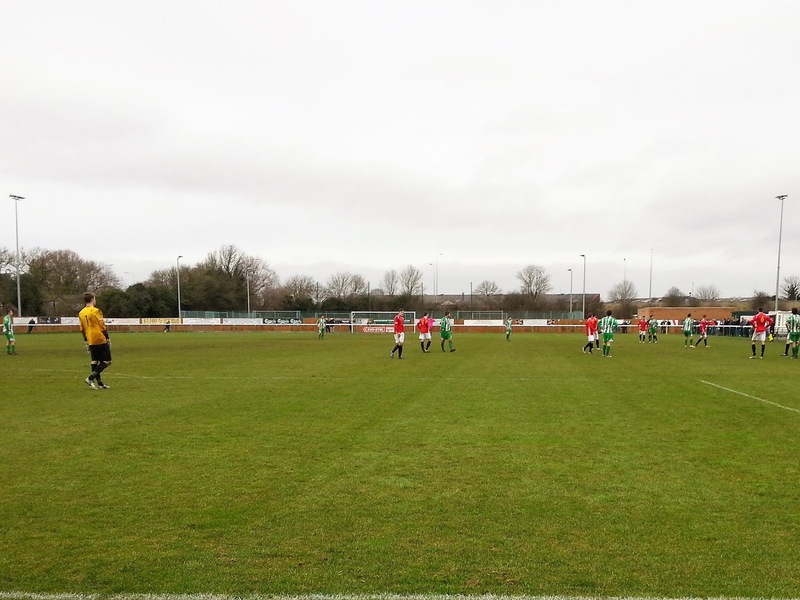 Biggleswade Town's best run in the FA Cup game during the 2013/14. 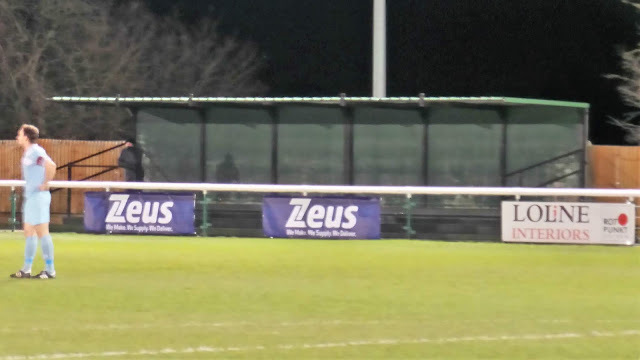 After overcoming Wingate & Finchley 4-3 in a 1st Qualifying Round replay, Conference South side Chelmsford City were beaten 2-0 in the 2nd Qualifying Round. 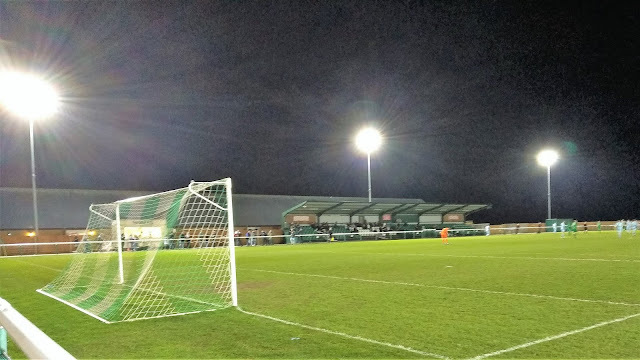 Leatherhead were then hammered 5-1 in the 3rd Qualifying Round before a 1-0 victory over Canvey Island in the 4th Qualifying Round. Cup specialists Stourbridge ended their dream in the 1st Round with a 4-1 victory. 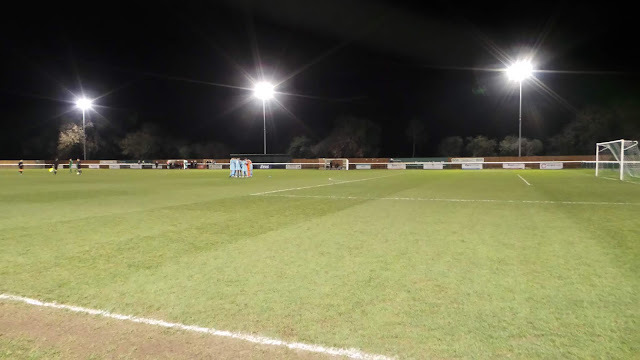 The FA Trophy 2nd Qualifying Round has been reached three times whilst the FA Vase Quarter Final was reached in 2009 before a 5-2 defeat at eventual winners, Whitley Bay. 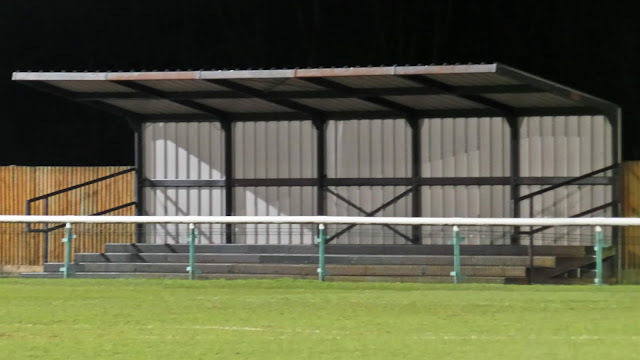 Local cup honours include United Counties League Cups, South Midlands League Cups, three Bedfordshire Premier Cups, eight Bedfordshire Senior Cups and five Huntingdonshire Premier Cups. Well known former Biggleswade Town players include the sadly deceased Mitchell Cole and current Wycombe Wanderers midfielder Nick Freeman. 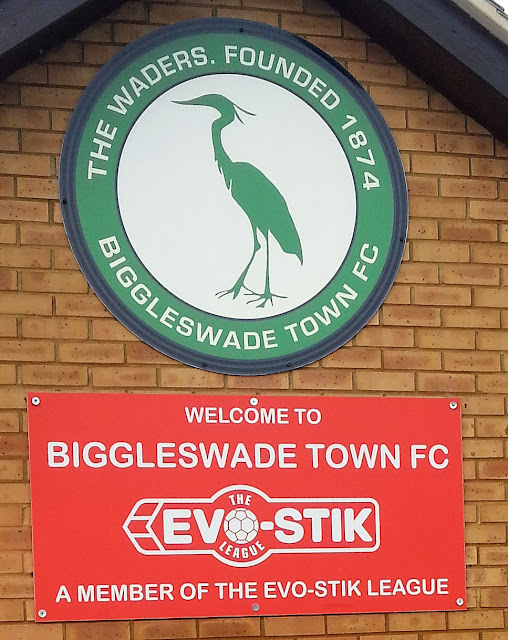 Biggleswade FC was established in 2016 as a result of Biggleswade Town's successful U18 side. They joined the Spartan South Midlands Division 1, winning it at the first attempt. After finishing 5th in the Premier Division last season, they sit 3rd before my visit. 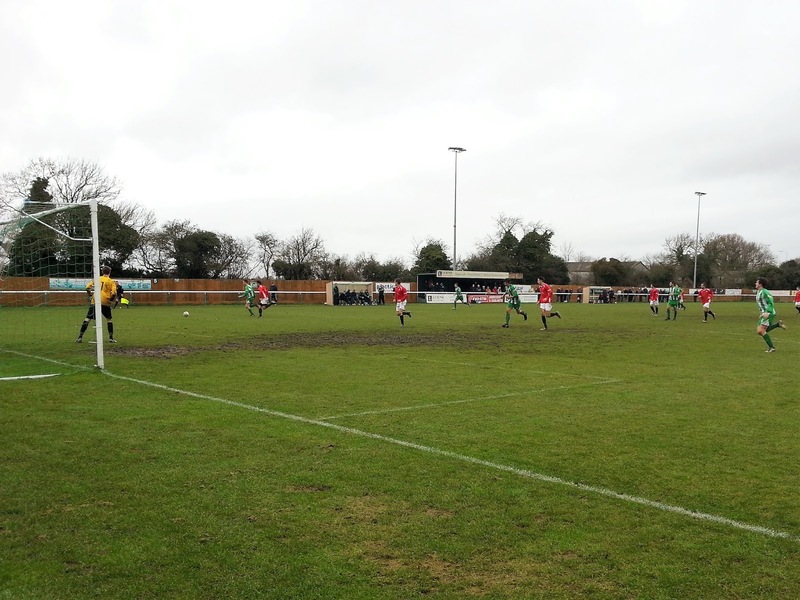 Best runs have been to the 4th Round of the FA Vase last season where they lost 2-1 to Thatcham Town, though they could match that this season. 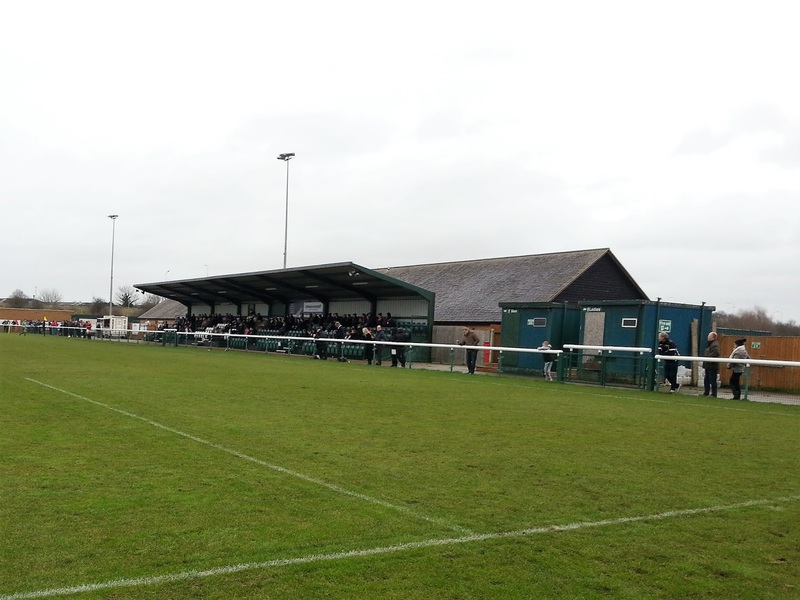 The FA Cup Preliminary Round was reached this season, before a 5-3 defeat to Soham Town Rangers. 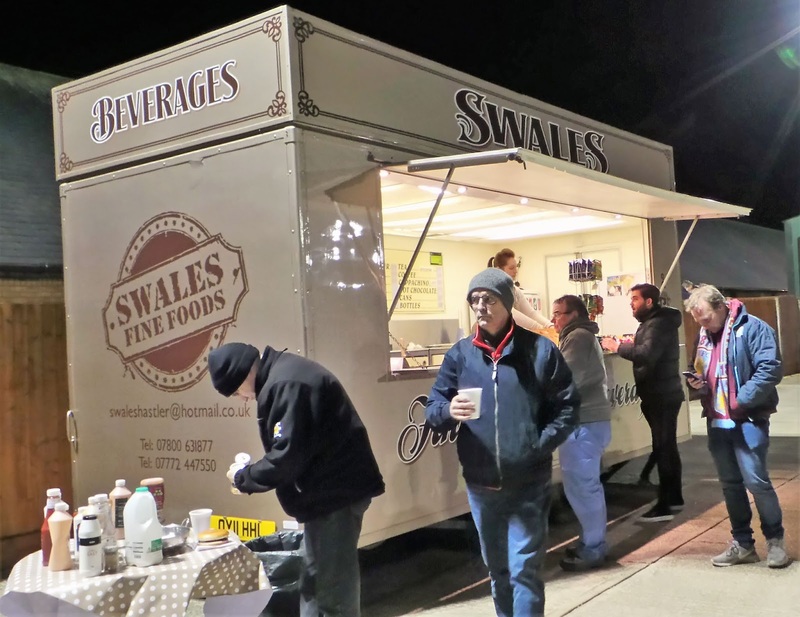 Despite having a population of just over 16,500, the town of Biggleswade has a third non-league team playing in the town, with Biggleswade United just below them in the SSML Premier. The town was part of the Great Western Railway, opened in 1850 and was the first town in Bedfordshire to have a railway station. Famous people from the town include novelist and 'Songs Of Praise' presenter Pam Rhodes. 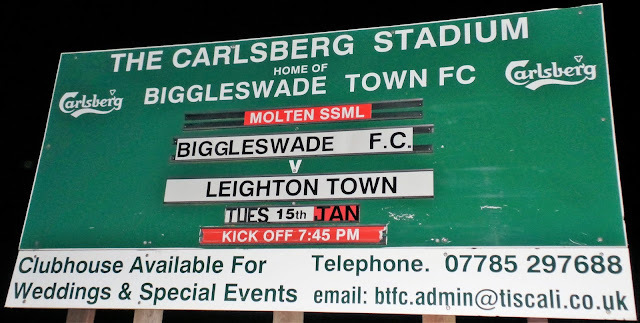 I had been meaning to visit Biggleswade Town for some time now. I have quite a few mates in the area and they had agreed to come to the game with me if I ever visited. My first 2 attempts had been thwarted - the midweek league game against Slough Town had been twice rearranged due to the visiting side's cup commitments and had even been rearranged again in between me deciding to make this visit and actually going. I was planning to do 2 games today, firstly this one at 12, then Bedford Town v St Neots in another local derby at 3PM. This was in preference to going to Cheltenham v Wycombe, a ground I had been to many times before. They were also charging £20 to get in, and up until Christmas Eve, the game was all ticket - the Gloucestershire side finally reversing their decision after poor ticket sales compared to the support that Wycombe usually took there. Despite consuming pretty much my weekly allowance of booze on Christmas Day, I didn't feel tipsy in the slightest on the day, and the same applied on Boxing Day as I woke up as fresh as a daisy. There was a pitch inspection due at 9am with the possibility of the game being called off due to a waterlogged pitch. 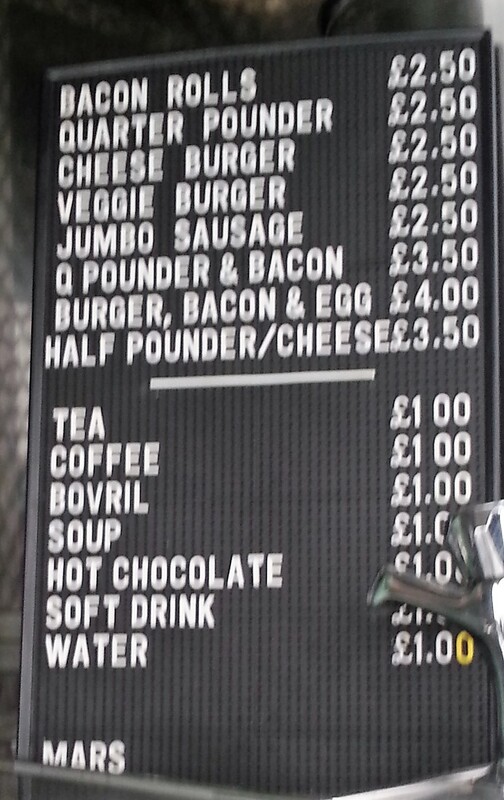 But I was happy to see the news on Twitter that it was game on/ After a quick breakfast, I was on my way just before 10. I had arranged to meet Chaz in Sandy at about 11.15 and that went without a hitch. Then it was onto Biggleswade to meet Jordan, but when we went to see him he was still in bed, so we popped in for a chat for a bit before picking up Ryan in the town and heading off to the ground, getting in to the ground just as it kicked off. 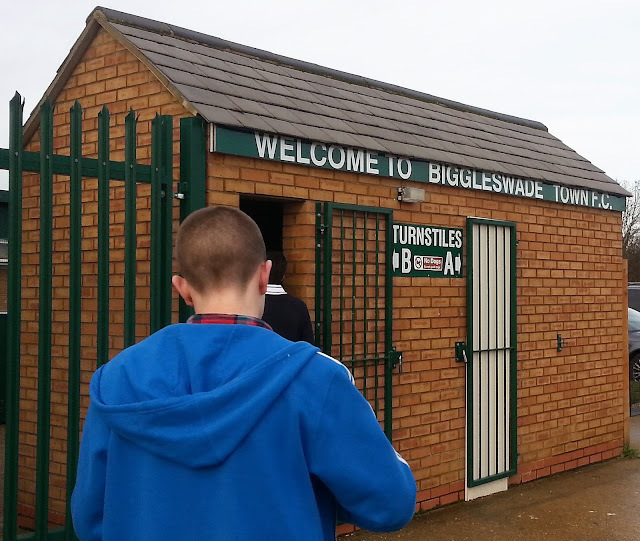 Biggleswade were on fantastic form prior to the game, having won 5 out of their last 6 games and drawing the other. Royston were challenging near the top too, but their form had tailed off recently and they had only on 2 out of the last 6, losing 3 games in that period. 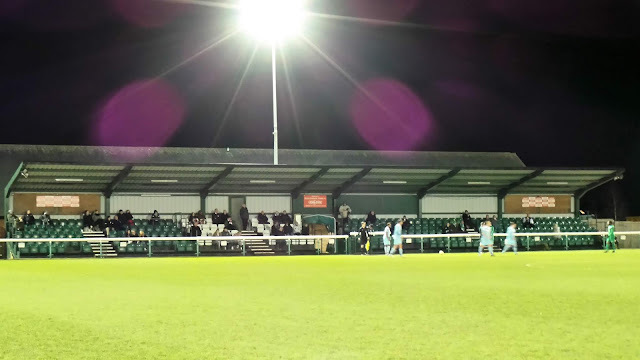 I had seen one of those performances, as they lost 2-1 at Rugby Town, giving a good account of themselves, and having the better of the start of the game before Rugby came back into it and deservedly won. I was well on my way to seeing a game at every ground in this league but had only been to take pictures at Royston, that being on the way to Histon v Barrow back in 2010. 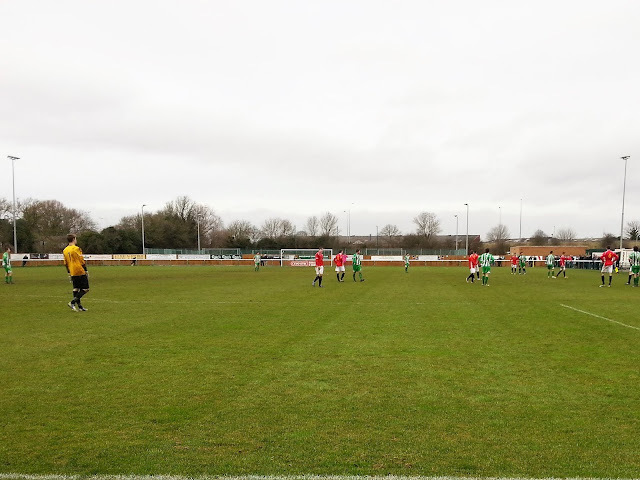 The game was a typical feisty local derby, with plenty of meaty tackles flying in and it shaping up to be a decent game. 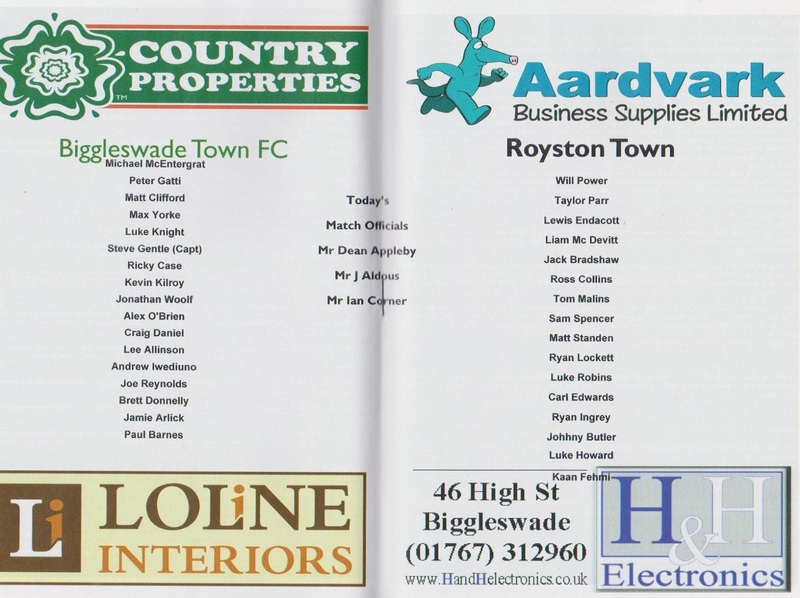 It was a tricky pitch to play on with all the rain and Royston just about edged the opening stages of the game. But the home side were coming into it more and more and the game turned when a Royston player made one of the most blatant handballs I have seen, tipping the ball over the bar with both hands, as if he were a goalkeeper. There was only going to be one outcome - a sending off, ans a penalty to Biggleswade. Lee Allinson duly scored in and from then on the home side were well on top. Craig Daniels got a second on 37 minutes with a decent strike and with it being 2-0 at half time it looked to be an uphill task for the visitors in the second half. 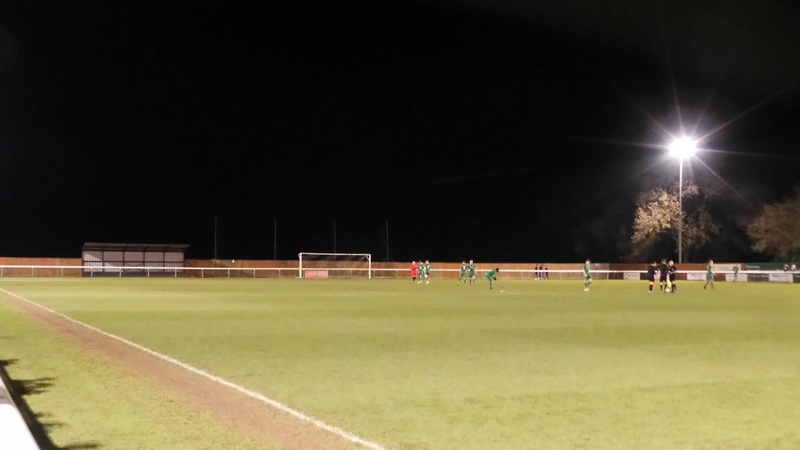 Biggleswade looked to shut up shop and attack on the break during the second half with Royston not looking like making a comeback until the last 10 minutes. Kaan Fehmi eventually got one back around 5 minutes from time and despite having the better of the game from that point on, Royston never looked like seriously threatening an equaliser. It had been a good game with decent company, and happily, Chaz had agreed to come with me to Bedford. But Ryan had family around and so after going into town to place our bets, I dropped him home and headed off to Bedford. Overall I had enjoyed my day at Biggleswade, it was a nice place to visit, and having the company of mates just made it better. 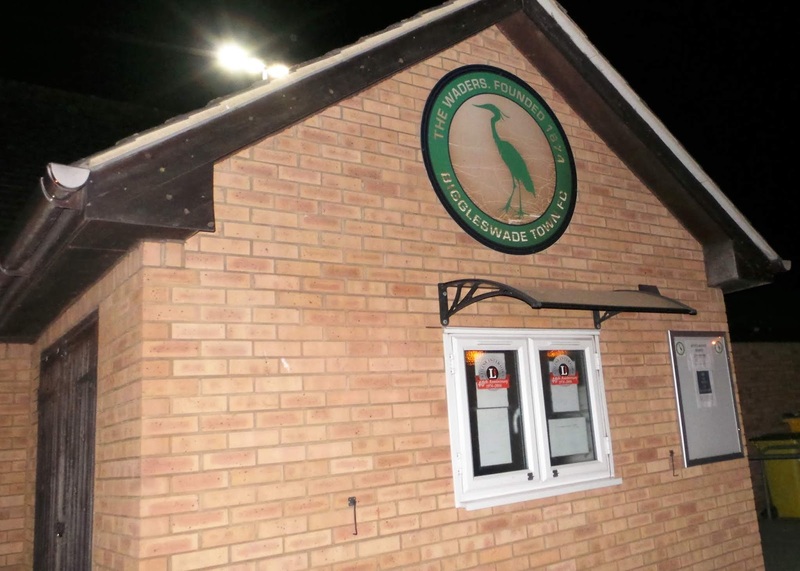 Biggleswade Town was a ground that fellow hopper Anwar had wanted to go to for a while and with my pictures and blog of it not being the best, I was happy to go along for a revisit. We'd be attending for a Biggleswade FC game as opposed to a Biggleswade Town one as it worked out cheaper. 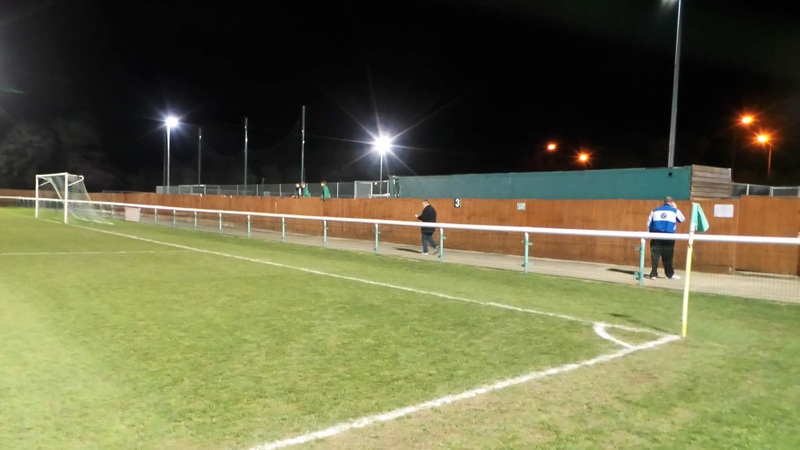 The initial plan was to visit a couple of Sundays ago for a FA Vase game, but I was too tired in the end following a late night on Sunday. However, when we looked at this weeks options, it came up, so whilst at the Wycombe game against Doncaster on Saturday, we decided to do their game against Leighton Town the following Tuesday. Back to Saturday's game, Wycombe looked dead and buried at 2-0 but managed to rally in the last 10 minutes to win 3-2. On the day of the game, I walked down town, buying a few bits and getting a lift back with my Dad. The afternoon was spent trying to get an iPega gamepad to work, a fruitless task and the second poor product I've had from that company. Luckily I'd bought it from Amazon, so returning it was free and fairly painless. I'd already got a refund before the night's game had even kicked off too. After a dinner of Jambalaya, I left at 5.35. Thanks to a slow tractor deciding to use a busy road during rush hour and some additional roadworks, I didn't get to Anwar until 6.15. He was there waiting and we were soon on our way. The roads on the way to Biggleswade were not much better, all crappy country roads that weren't pleasant to drive on in the dark. Google Maps had the ground location wrong too, but eventually, we got there at 7.30. After getting some pictures of the outside and paying £6 to get in, we got in just as the teams were coming out. Biggleswade started the brightest and they had the ball in the net on 24 minutes when Pat McCafferty headed home a hanging cross, but the goal was ruled out for offside. It had been a poor first half and the second period was not much better, with the game being a scrappy and niggly contest. There were few chances for either side, but I did recognise one of the Leighton subs who looked a bit like Seb from Coronation Street and who had played for Totternhoe when I saw them last season. 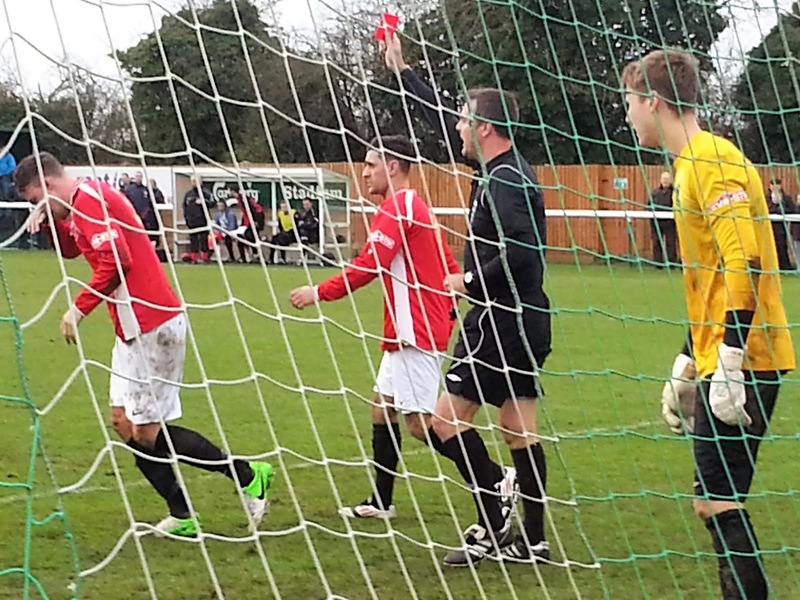 Kyle Davison-Gordon was sent off for Leighton Town, a foul just outside the area earning him a second yellow card. From the resulting free kick, a well-worked move saw a shot whistle narrowly past the right-hand post after an effort by Lawrie Marsh. The final whistle blew at 9.45 to end the worst game I've seen in a long time in the usually entertaining Spartan South Midlands League. The game finished quite late and we didn't leave until 9.50 with me dropping Anwar off at 10.50 and getting home myself at 11.15, going to sleep around an hour later. 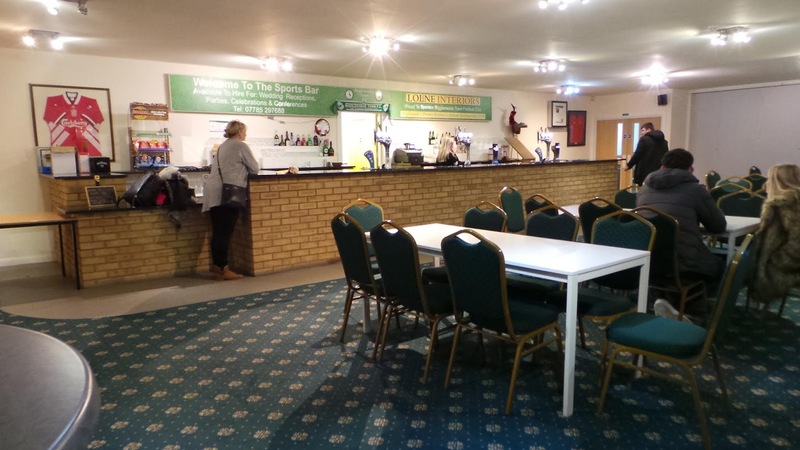 THE CARLSBERG STADIUM is s smart modern ground and despite being built as recently as 2008 was Biggleswade's first home of their own, having previously shared with the town's cricket club. I had previously been to the ground when it was being built back in 2007 on the way to a Peterborough v Wycombe game. Mostly it was open standing with not too much development but this is the norm with most new grounds at this level. 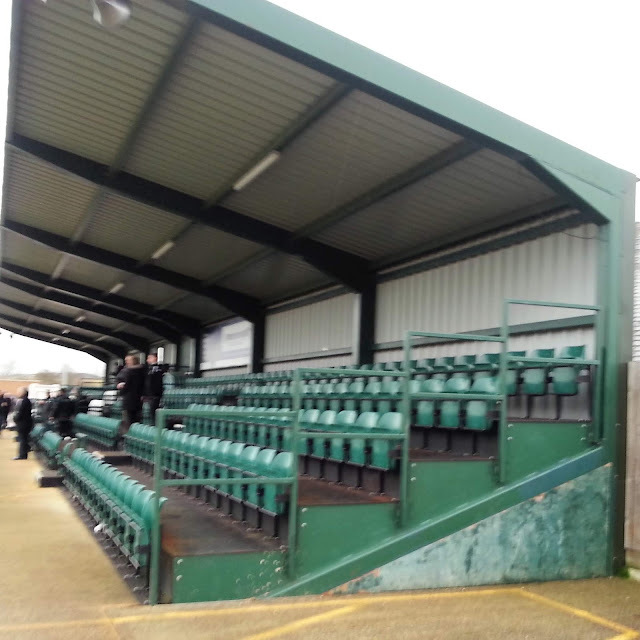 There was a covered stand on each side, one seated and one standing, holding around 200 people in each.